If GetSite() returns null, you’ll get a null reference exception, because they didn’t bother to check the returned variable before trying to use its ‘SiteInfo’ property. It does offer a clue, though. Our upgraded system lacks a site called ‘website‘. That is, in our config, under the <sites> node, there is no <site ... > called ‘website‘. 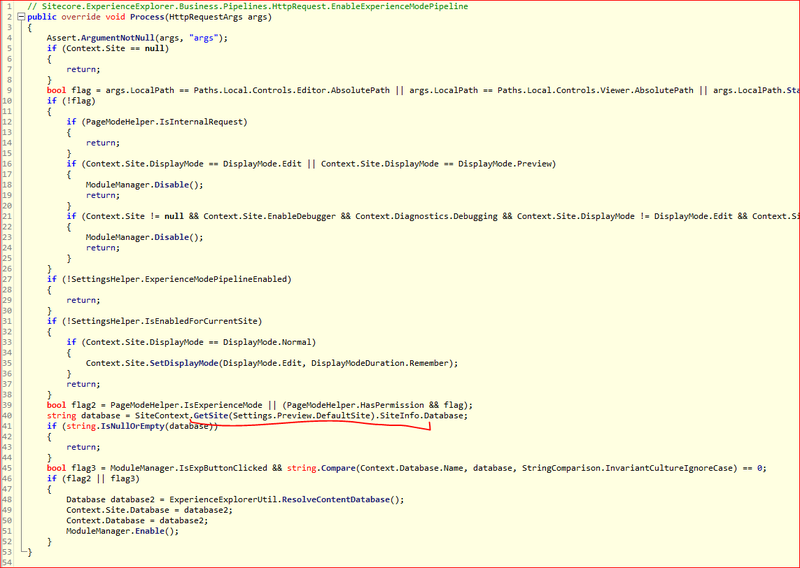 However, the DefaultSite setting in Sitecore.config still had its default value of ‘website‘. We changed it to the name of our site, and this error was resolved. This is annoying misconfiguration I’ve come across a few times – tracing has been enabled on production systems. Having tracing enabled allows an attacker to view the last 50 web requests made to the server, including information like Session ID values and the physical path to the requested files. However, you can do a bit more than that. I believe that this problem occurred on live sites because configuration files were promoted from development to production. To this end, you can set localOnly="true" – this means that trace is only available on the local developer’s machine. This doesn’t substitute for disabling trace, but it does help reduce that risk.